With the Galaxy S9, Samsung intended to impress with exciting new camera features, designed to improve photo quality, especially in poor light conditions. At Mobile World Congress 2018, we were able to get a first impression of the new Galaxy smartphone and the most highlighted feature by Samsung: the reimagined camera. What exactly are the differences between the S9 and S9+? A new sensor, enhanced software and - a first for smartphones - the dual-aperture that can be enlarged to f/1.5 to capture more light: These are all the ingredients Samsung has added to its new flagship to further improve the camera's performance. In the streets of Barcelona, we wanted to see if they had pulled it off. Wherever we went in Barcelona, the S9 came with us. It took impressive photos in an enclosed market hall, as well as when we were enjoying some tapas in an open-air bar. What struck me is the speed with which the camera determines the focus and settings, and I can't recall ever using a phone that has a camera as fast as this. The colors produced are a brighter than they appear to the human eye, but still natural-looking, and the exposure usually works well in automatic mode, which the vast majority of photos are taken in. Typical situations where HDR is required, is when smartphones start to struggle. The Samsung Galaxy S9 manages amazingly well in automatic mode to capture both dark and light areas in a photo, without either excessive brightness or dark areas. In the picture of the Samsung store, for example, the structure of the exterior wall is just as detailed as the lit-up interior. For close-ups with a blur effect, the S9+ dual camera is actually more suitable for close-ups. However, devices like Google Pixel 2 and now the Galaxy S9 show that it's possible to conjure up a flawless bokeh effect with a single lens, and although the blur is not calculated 100 percent correctly, in most cases the effect works well. Samsung has made a lot of progress in this area over the past few months. In a dimly lit bar, it's hard to take sharp photos without the flash. Even with the Galaxy S9 you'll still see some blurry faces, but whoever fits the right moment will also be able to take good photos at the counter - if you've had a few drinks, the image stabilizer will be useful! How does the front camera compare when in low-light? We stood close to a store to get a some light in the evening to try it out. The detail of the selfies taken with the S9 also deliver good, consistent results. Obviously, if it's very dark, it's a different story, but every smartphone has its limits and the Galaxy S9 is no exception. It's difficult to know the exact reason why these reflections happen, but I assume that it's a software problem. Samsung composes the final photo from several differently exposed images. Its quite possible that the device has an issue with selecting the frame. The new aperture itself is not the reason for this, as the effect can be seen with the front camera too. It could be that the firmware in the pre-series devices still contains an error. We've contacted Samsung about this and will keep you updated. Want to see more photos from our camera review? It is still too early to make a final judgement on the Samsung Galaxy S9 camera, especially because we haven't had the chance to compare it with other devices. But one thing is already clear: the new Samsung camera is just as good as the Galaxy S8. Even though the effects of the flexible aperture need to be looked at in more detail, it is impressive how well the S9 copes in poor lighting conditions. However, the problems with the reflections, which are more pronounced than expected, were surprising. The Samsung developers will probably have to rework something here. 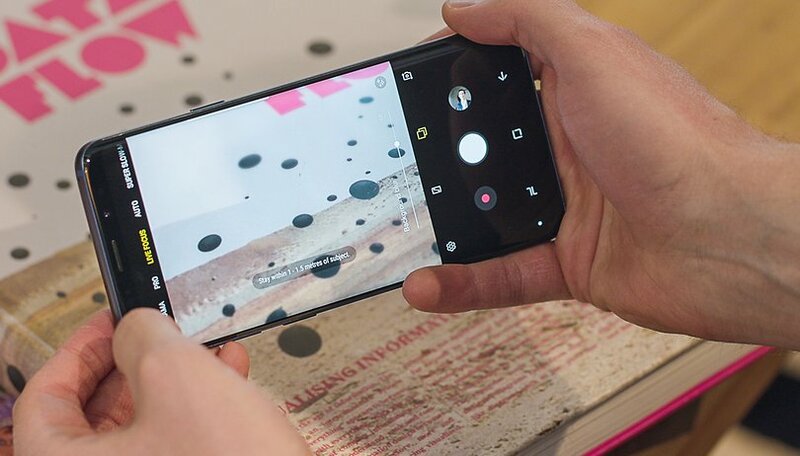 We're looking forward to testing the Galaxy S9 camera against the competitors: Google, Apple, Huawei and others during the extensive camera test. What do you think of the photos in this review? Is the S9 camera living up to expectations so far? Thanks for the pictures. I've checked the cloud gallery and I have to say I'm really dissapointed. I really don't understand the hype with this new camera. Look at the ones taken on the street, they're mediocre. You get the same result even with a LG G4. damn that yellow-ish tint. exactly why i got rid of my note. color accuracy on samsungs just aren't there. sad that the brand with the worst image quality is also the one with the best color accuracy, Sony. So excited for it! I hope it will meet my expectations - especially the camera! I did something I never have before, I pre-ordered the s9+. I'm looking forward to testing it out for myself. If it's anything like the quality of the pixal's that would be great. Will see! As usual with samsung camera's colour's are not natural.